The abundant nature, ecosystem, and natural environment that surrounds the Kounotori (Japanese stork) is where this Koshihikari rice is raised, with farming methods created out of consideration to the Kounotori's development. Based on pesticide-free, and agricultural chemical reduction methodology, even fertilizer is utilized no more than absolutely necessary. 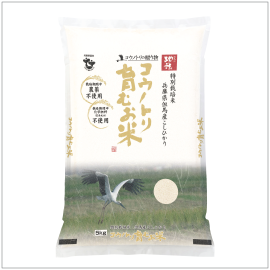 Kounotori Natural Koshihikari Rice is grown safely and securely, by the power of nature.